I always thought these were so cool to serve as a side dish when I was growing up! I can't believe it wasn't served as a whole meal. Once you add rice, meat, sauce you have a whole boat load of a tasty meal! 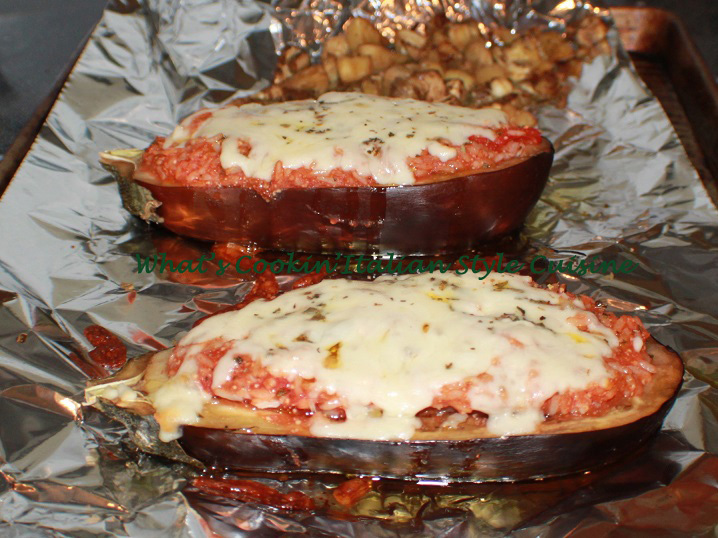 (Smile) These eggplant boats are very versatile. You can add more ingredients or less. 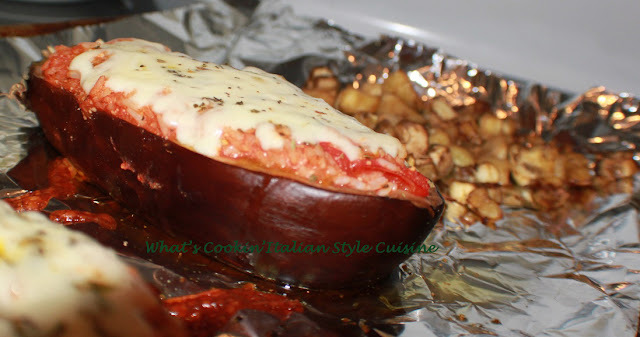 Grilled or Baked a special treat awaits all you eggplant lovers out there! Melted cheese blends are the best. Provolone, Mozzarella, Fontina to name a few that melt perfectly. Try a five cheese blend it really complments the fillings! I save the insides for omelets or saute the eggplant chunks with peppers for a great sandwich! There is no reason why you can't use the inside mixed with sauce and cheeses to fill the boats back up. I just prefer a rice filling. Optional items to add: add 1/2 cup cooked meat of choice, cut up sirloin, cooked hamburger meat, chopped cooked chicken, chopped cooked lamb, cut up ham, loose sausage cooked or pepperoni. Optional: add mushroom slices, black olives, white beans, ricotta cheese, mixed with grated cheese and mozzarella. On a cutting board, cut the eggplant lengthwise in half. With a sharp knife carve out each middle leaving the bottom and sides around 1/2 inch thick all around. In a medium size bowl mix everything together including the meat if using but not the mozzarella cheese. Fill the boats with the rice mixture. Top with shredded mozzarella and provolone cheese. Drizzle with olive oil. Bake in a preheated 350 degree hot oven on a parchment lined cookie sheet and drizzle egg plants tops with olive oil. If putting on the grilling place on a large greased piece of foil and pull the sides of the foil up around the boats. Grill on low until fork tender around 35 minutes. 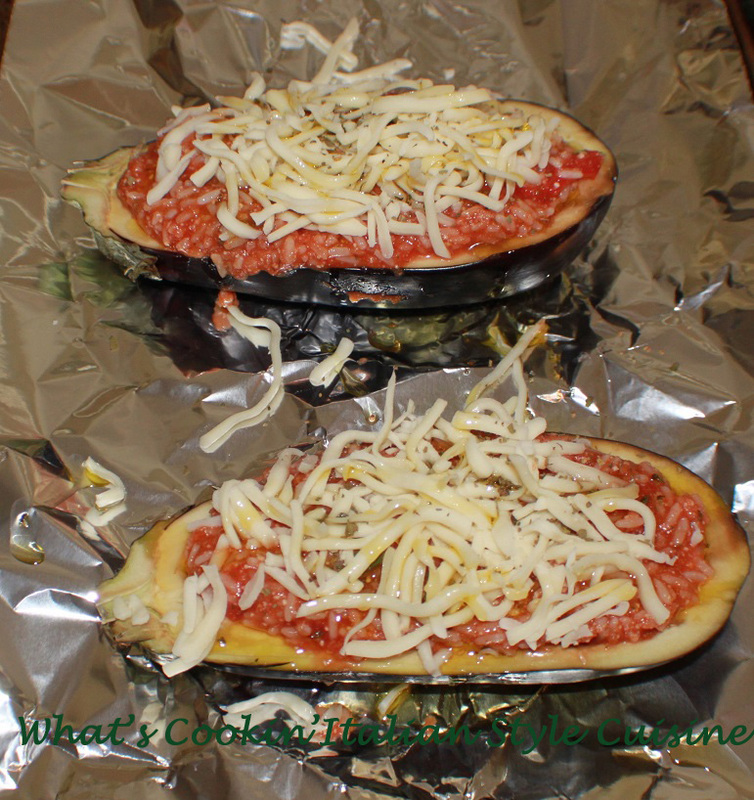 In the oven or grill place the chopped insides of the eggplant on the baking sheet tossed with olive oil, salt, pepper and garlic powder evenly. 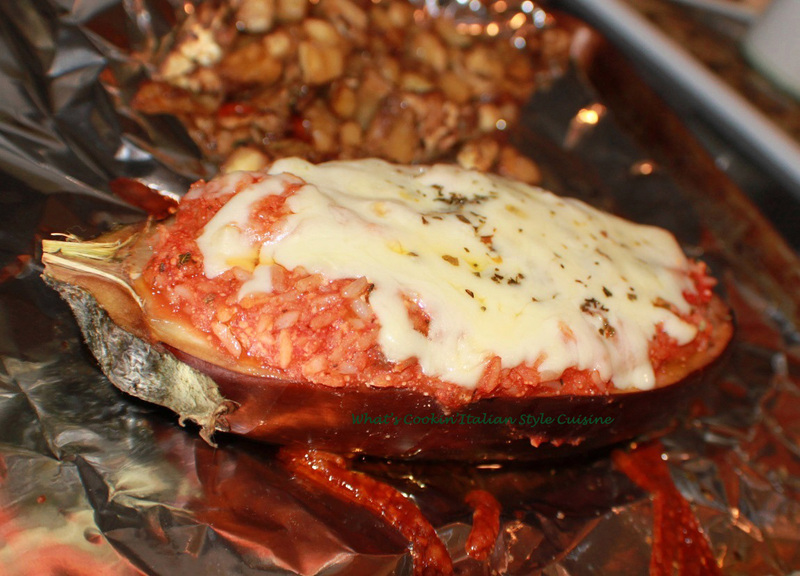 Use can use this roasted eggplant later in another dish tossed with your favorite sauce and pasta.